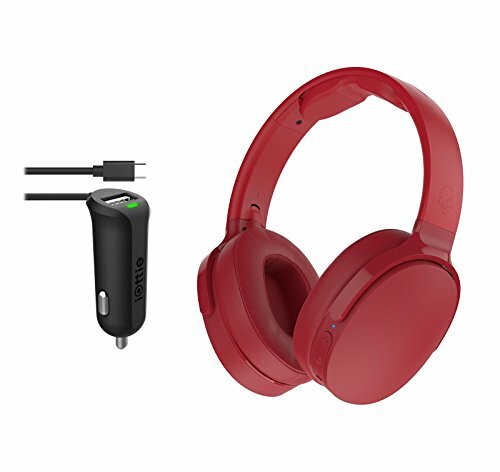 Skullcandy HESH 3 Red Wireless Bluetooth Headphones With iOttie RapidVolt Micro USB Car Charger by Skullcandy at All Company Mobiles. MPN: S6HTW-K613-CHCRIO102. Hurry! Limited time offer. Offer valid only while supplies last. Fold And Go Multi-folding hinges allow this full-featured, over-ear headphone to conveniently fold up for easy carrying and storage when not in use. Ear cushions made of memory foam aren't just incredibly comfortable, they create a seal that isolates outside noise and keeps your music in - all you hear is rich, dynamic audio free from interference. The multi-fold hinges also pivot side to side, allowing Hesh 3's earcups to adjust comfortably to any head shape - it also allows them to lay flat on a table or around the neck when not in use. Bluetooth® technology and multi-use foldable design. 4 hours of play time after 10 minutes of charge. Built in Micro USB charger with secondary universal USB charging port.